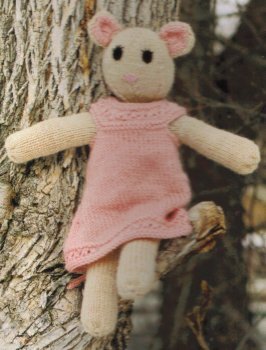 Taken from Phoebe's Sweater: "Phoebe Mouse is a nearly seamless knit worked in the round, except for her ears, which are worked back and forth and stitched on at the end." Size US 5 DPNs & 7 - 11" circs (or sizes needed to obtain gauge), scrap yarn and/or buttons to embroider the face and toy stuffing are required but not included. Finished Measurements: About 16" tall. Colors Shown are Oats 'n Cream & Strawberry Chiffon.